This book contains information from basics to the most advances for enhanced learning, examination preparation, and clinical practice. Latest imaging platforms and images with interpretation are discussed at length. 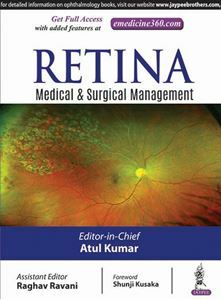 Detailed description about the diseases of retina and vitreous and management with each disease being discussed in separate sections and then chapters. Contains information in the form of Tables, Flowcharts and Figures in a comprehensive manner for rapid reference and efficient recall. Includes multiple colored clinical pictures, ultrawide field imaging, fundus autofluorescence, high-resolution optical coherence tomography, OCT angiography apart from fundus fluorescein imaging, and indocyanine green angiography. Contains detailed update on evolving surgical technology and techniques along with recent advances in vitreoretinal surgeries and future horizons in retinal disease and management. Surgical videos are enclosed with book. Chapters 15, 16, 17, 18, 19, 47, 50 and 58 contain video(s).